Batting Around: Rock Cats to Hartford? 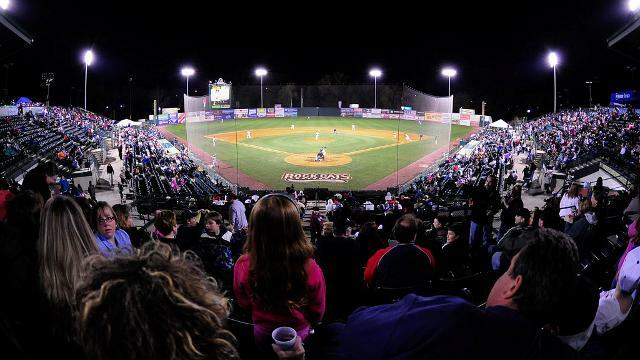 The New Britain Rock Cats' lease with the city of New Britain, Connecticut, expires at the end of the 2015 season. In 2016, the team might move 12 miles north to Hartford. News regarding this potential relocation first broke June 2, with the Hartford Courant reporting that "there is a proposal to build a stadium at Main and Trumbull streets -- an area known as '12B' just north of downtown. The team would begin playing there in the 2016 season." Negotiations between the Rock Cats and Hartford city officials regarding the potential move were done in secret. As such, the news caught many off guard and put the city of New Britain on the defensive. "Spoiler alert," tweeted New Britain mayor Erin Stewart shortly after the story broke. "The Rock Cats aren't leaving New Britain." But just two days later, a press conference was held on the steps of Hartford City Hall to announce the city's intent to build a new $60 million stadium for the Rock Cats, the Double-A affiliate of the Minnesota Twins. "This stadium will greatly expand our central business district and will also enable us to reconnect with North Hartford -- a community that greatly needs an infusion of jobs and opportunities," said Hartford mayor Pedro Segarra at the press conference, as Rock Cats owner Josh Solomon and several Rock Cats players looked on. Though the press conference signified Hartford's clear intent to land the Rock Cats, this is far from a done deal. Hartford City Council still needs to approve the funding necessary to construct the stadium, and a vote on this issue has not yet been scheduled. "[M]ake no mistake, the stadium proposal is exactly that -- a proposal," wrote Hartford city council president Shawn Wooden in a Hartford Courant op-ed on June 23. "The city council was informed of this plan the day before it was announced and we are now doing what we did with the budget and have done with every proposal before us. We are examining it thoroughly to make sure that taxpayers are protected, our core priorities are not compromised and that the potential benefits are real." The Rock Cats have played in New Britain since 1983, when they were known as the New Britain Red Sox and competed at Beehive Field. They changed their name to the Rock Cats in 1995 and moved next door to their current home of New Britain Stadium the following season. Columbia marches forward: Another city that may be fielding a new Minor League Baseball team in 2016 is Columbia, South Carolina. City officials have been working with Minor League owner Jason Freier (owner of the Savannah Sand Gnats and Fort Wayne TinCaps) to secure public funding for a stadium, which would be built as part of a larger downtown redevelopment project. As reported in previous editions of this column, the new stadium has been a contentious issue within Columbia city government as well as the city at large. Ballpark opponents continue to be frustrated with the rapid pace at which the project is proceeding, saying that more public dialogue and transparency are needed. On June 11, the Columbia City Council, citing construction deadlines, voted to forgo a cost-benefit analysis that would have further illuminated the pros and cons of building a facility. Then, on June 24, they voted to borrow $35 million to fund the stadium via a loan that would be repaid via revenues from a hospitality tax. As for what team would move to Columbia, that remains an open question. Freier could relocate the Savannah Sand Gnats, whom he already owns, but he has said in the past that he would also be open to acquiring and relocating a different team. According to Myrtle Beach Online, Freier has a deadline of July 15 to apply with Minor League Baseball to relocate a team. Final approval must be received by October 1. Biloxi almost ready to build: In January, the city of Biloxi, Mississippi, held a groundbreaking ceremony for a new downtown Minor League Baseball stadium. But there's a big difference between ceremonial gestures and shovels in the ground, as construction has yet to begin. The Mississippi Sun-Herald reports that after a bidding process that concludes July 9, "a general contractor could start building July 21." If the stadium is not ready for the start of the season, the city of Biloxi owes the team $10,000 for each game not played in the ballpark. [Biloxi Baseball part-owner Tim] Bennett said contingency plans are in place, either to play several road games to begin the season or to play in a stadium that is not quite completed. This would be similar to the situation faced by the El Paso Chihuahuas this season, as construction delays forced them to play their first four home games in their previous home of Tucson. Now it's (almost) official: On June 17, Mandalay Baseball Properties announced that it had "entered into a definitive agreement with Chuck Greenberg and Scott Sonju for the sale of the Frisco RoughRiders franchise." The sale still needs final approvals from the Texas League and Major and Minor League Baseball, though no obstacles are expected in this regard. Greenberg, the former CEO of the Texas Rangers, now owns two Rangers affiliates -- the RoughRiders and Myrtle Beach Pelicans -- as well the State College Spikes. Meanwhile, four teams owned by Mandalay Baseball Properties remain on the market: the Scranton/Wilkes-Barre RailRiders, Erie SeaWolves, Oklahoma City RedHawks and Dayton Dragons.